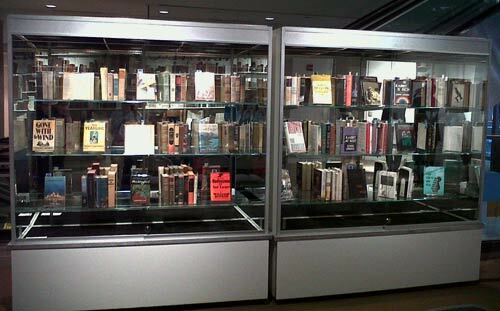 A complete collection of Pulitzer Prize-winning fiction books will be up for auction at Sotheby's in New York on June 15, 2012. A collection of first editions of all 85 Pulitzer Prize-winning fiction books went on the auction block at Sotheby's in New York on June 15, 2012. The final bid of $47,500 was slightly less than Sotheby's estimated value of between $50,000 to $70,000. We have also learned that the seller had a reserve of $50,000, and so the collection remains in his possession. The collection was offered as a single lot, and was on display from June 9th to the 14th at the Sotheby's New York City show room. The bidding was open to both online buyers as well as buyers present in the auction room where the collection was in full display. The lot opened at $30,000 and had seven bids before the gavel dropped for an auction room buyer moments later. The collection comprised books spanning the full 94 years of the Pulitzer Prize award history beginning with Ernest Poole's 1917 novel His Family, and continuing to Jennifer Egan's 2010 novel A Visit from the Goon Squad. The books were assembled with significant care and attention by a dedicated collector who began his quest over fifty years ago. By and large the books were in good collectible condition with a few understandable exceptions. It appeared to be a complete collection with just one exception that we saw - the signed edition of Years of Grace was a later printing (it lacked the year 1930 on the title page). However the dust jacket was a first issue which is extremely rare. The rest of the books appeared to be first editions at first glance. On the plus side, the big money books were present with what appeared to be first issue jackets - Gone with the Wind (signed! ), Grapes of Wrath (signed! ), and To Kill a Mockingbird. Other likely first editions in the collection included The Old Man and the Sea, The Age of Innocence, The Magnificent Ambersons (with no price on the DJ spine), Alice Adams (signed), Confederacy of Dunces, Beloved (signed), The Color Purple, The Optimist's Daughter (signed), The Yearling, and Tinkers (signed hard cover). The copy of One of Ours was a "de luxe" signed first edition rather than the first trade edition. Likewise, the copy of Arrowsmith was a signed and numbered first edition, and so too was the copy of Andersonville. Although there were only 85 winners of the Pulitzer Prize for fiction, there were actually 93 books in this collection because it had both the first limited editions and first trade editions of some of the more recent titles such as The Confessions of Nat Turner, Foreign Affairs, Breathing Lessons, American Pastoral, Rabbit is Rich, Rabbit at Rest, and Independence Day (Trice Publishing Edition). There were also two copies of The Hours - one was a first edition, and the other was a signed later printing. On the minus side, the dust jackets and slip cases were not complete. The most obvious absence was His Family, and So Big was married to a much later (1950's) dust jacket. There was also a couple of later issue jackets - Tales of the South Pacific was both price-clipped and from a later printing or reprint; Advise and Consent had a Pulitzer Winner blurb on the front which indicated it was from a later printing; The Cain Mutiny also had a Pulitzer mention on its dust jacket and so it too was from a later printing; and A Visit from the Goon Squad had a later issue dust jacket. Also, the numbered copy of Arrowsmith lacked its slipcase. From a very brief examination of the collection, we estimated its general grade to be a 10+B using our PPrize Collection Grading System. The signed first edition copies of Gone with the Wind, Grapes of Wrath more than compensated for the later signed printing of Years of Grace. For the dust jacket portion of the grade, it was difficult to overlook that five dust jackets were later issue, one was missing, one was from a much later edition (So Big), the jacket from A Bell For Adano was in poor condition, and the dust jacket spine of Journey in the Dark was faded. But on the other hand, the collection does include the rare first issue jacket from Years of Grace, and a dust jacket form Lamb in his Bosom - both in collectible shape. So we gave the jackets a flat B grade with neither a plus nor minus. This grade was a rough estimate based on an unoffical and cursory examination of the books. We didn't have enough time to look through each book thorougly to say for sure that each was absolutely a true first edition. That type of assessment would take several days to complete. I started collecting about 50 years ago when I happened to read A Death in the Family by James Agee. I subsequently noticed that it won the Pulitzer Prize and I decided to read every novel that had been so honored. (There were only about 35 at the time). I did not have many funds and purchased only reading copies of the books from used book stores. I noticed that each time I ordered a book from a dealer, he would ask whether I wanted a first edition. I decided there must be a reason for this and began limiting my purchases to first editions. Then I was hooked and had to replace all my previously purchased "reading copies" with firsts. Then I discovered the importance of dust jackets and proceeded to replace all of the firsts I had purchased without dust jackets to more costly copies with dust jackets. Then I decided I would like to have signed copies, so whenever they became available, I would replace perfectly good firsts in dust jacket with signed firsts. As you can well imagine, this process has caused me to accumulate many, many duplicates, most of which are in excellent shape. I will work on disposing of these later, but will enjoy them while I have them. In recent years, the minute the Pulitzer winners are announced, I rush to the book stores and hope that I will find a first on the shelf. Sometimes I am lucky. If I am lucky enough to find two, I buy them both and send one to the author requesting a signature. In each case, I received the signed book back from the author with a nice note. So you might say I evolved from a reader to a very unsophisticated collector to a somewhat more knowledgeable one. The process has been a great and most satisfying journey. There are several reasons I have decided to sell the collection. First, I wanted them to fall into the hands of someone who would really appreciate them and not just be disposed of willy nilly after my death. Secondly, the cost of insuring the books, which are now rather valuable, is prohibitive. They have been uninsured these many years, and we always worried when we were away that something may happen. Once it almost did when our home flooded and the flood waters came within a few inches of the books. I did consider selling the books separately, and this may well have generated a higher price, but I like to think of them as a group that some institution or collector would like to have as a complete collection. Maybe I have begun to think of them as children that I would like to keep together. My best bookstore buy was a signed first edition in first issue dj of The Store by T.S. Stribling. It was purchased around 1975 and the price was $10.00. I will continue to collect first editions of fine books that I come across. I will just not be driven to accumulate all of anything. It will be much more laid back.